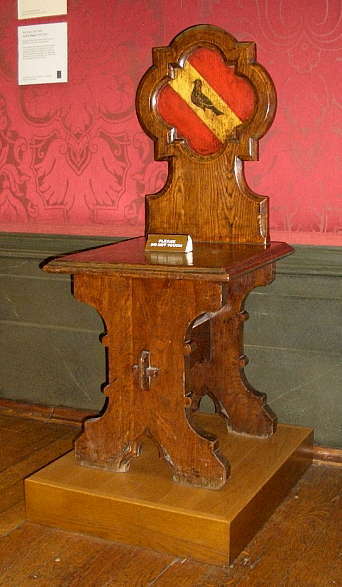 According to the wall plaque at the gallery, this small low chair was made for Pugin's own use; the crest here is his own. The dates given by the gallery indicate that the chair was made for his first house, St Marie's Grange in Salisbury. Plate 13 in Rosemary Hill's biography of Pugin shows just such a chair in the hallway of his second house, designed in 1884 — The Grange, Ramsgate. Here, it stands just beside the big central staircase, its painted bird device echoed many times over in the wallpaper pattern and even in the carpet. Photograph and text by Jacqueline Banerjee. 2008. With thanks to the gallery for allowing photography.